The goal of this post is to be an intro into the world of manufactured spending. This is ultimately a strategy game with many different ways of playing it. As a disclaimer, this is not for everyone. This is a very YMMV (Your Mileage May Vary) type of game. Again, THIS IS NOT FOR EVERYONE. I want this post to be seen as a “you getting your toes wet in the manufactured spending pool” type of post. Manufactured Spending (from here on out will be referred to as MS) is the process of using a cash back/points/mile earning credit card to purchase something that is equivalent to cash, such as a gift card or money order, and quickly liquidate it. The ultimate goal is to make a lot of money/points/miles for very little actual spend. Churning is the process of signing up for multiple credit cards at once, which is sometimes referred to as an App-o-Rama, to get the sign on bonus that the credit cards offer. The first credit card churn Jenni and I did was at the beginning of this month and consisted of 7 credit cards, but we will get to that a little bit later. Now, you may be asking yourself, “Doesn’t that hurt your credit?” The answer is yes and no. It does hurt your credit in the short term about 3-5 points per credit card application, since they use a hard pull on your credit report. However, those points will bounce back within a few months. This is why the average length of time between credit card churns is about three months. This is one of the reasons why this game is not for everyone. If you plan on getting a student loan, mortgage, or any other loan in the next year or two, you should not do this. Churning and MS go hand in hand. Once you churn 3+ credit cards, it is very likely that all or most of them have requirements to get the sign on bonus. An example of this would be the Chase Sapphire Preferred. You have to spend $3,000 in the first three months to get the 40,000 Ultimate Reward point sign on bonus. That may sound like a lot, especially when you have similar requirements on multiple cards, but when you manufacture that $3,000+ you are really only spending about $24. How is that possible and is it legal? Yes, it is 100% legal. The gist of it is you are buying a gift card with your credit card for the miles/points and you are using that gift card as you would cash. Now, I realize that doesn’t sound great at all. Having to carry around and use a gift card instead of a credit card or cash would be a pain, but in fact that gift card can be used to buy money orders, pay credit card bills, and much more. Okay, how do I start? I’m glad you asked! There are many methods to manufactured spending, but the easiest and best way to get into it is via the Bluebird method. Bluebird is the ultimate MS machine! Bluebird is a prepaid card that works like a checking card and acts like a debit card but is neither of those things. There are virtually no fees, which makes it one of the best cards in the prepaid world and it is extremely easy to MS with Bluebird. First things first, you need to sign up for Bluebird here. There are two options for signing up for Bluebird. You can either sign up at this link, which is free, or go buy a temporary card at Walmart and wait for your permanent card. I would definitely suggest signing up online, because the temporary card is pretty useless. 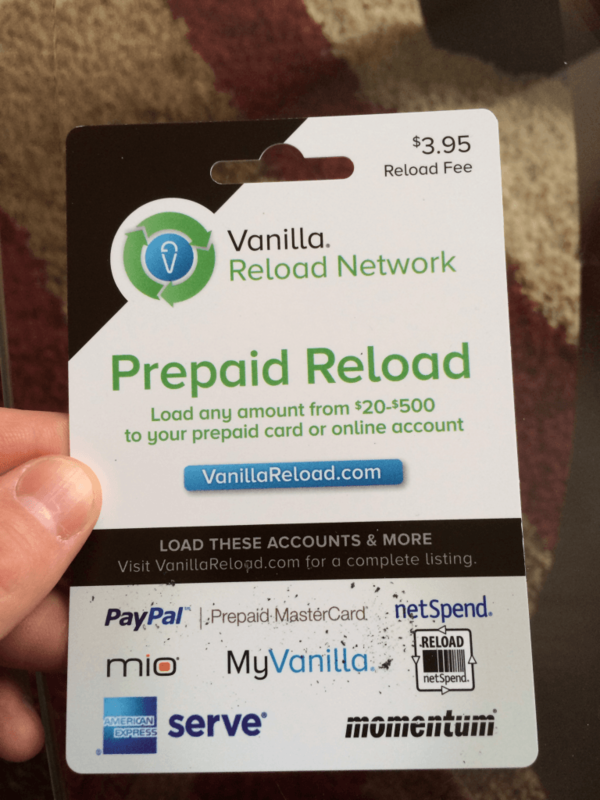 Once you have your Bluebird account and card, you need to find vanilla reload cards that can be purchased via a credit card. Finding VRCs is very easy, however it’s much more challenging to find ones that can be bought with a credit card. You can find a store that sells them here, however there are more places than you will find on that list that sell these. I have seen them at certain Speedway and Marathon stores, however those are not on the list of retailers, so you should definitely check the gift card rack at any store you frequent. Most of the retailers that do sell VRCs only allow you to buy them with cash, however the amazing CVS allows you to buy a maximum of $5000 worth of these a day with a credit card! In this example every VRC costs a total of $503.95 and has a $500 load on the VRC. Most of the points/miles you can get have a value anywhere from 0.8-1.7 cents per point/mile, so this ends up being an awesome deal! Alternatively, you can use these $500+ purchases towards your sign on bonus for whatever credit card you signed up for, which makes the process very quick easy, and cheap. On my next post I will be going more in depth on Bluebird and MS. If you have any questions, let me know.